These Starship Specifications are to be used with a Movie-Era based simulation only! The history of the Excelsior-class tends to consist of extremes. Initially fitted with a Transwarp drive and proclaimed "the great experiment", the ship had an ignoble start when its engines failed when it was called into action to prevent the theft of the USS Enterprise NCC-1701. 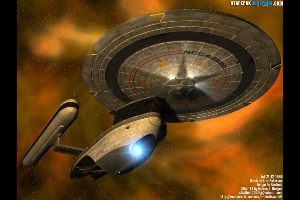 Although this was due to deliberate sabotage, it transpired that the prototype had been saved from a major disaster; engineers working to correct the damage discovered a series of flaws in the Transwarp drive which, had it been used, would have caused a nacelle implosion which would have destroyed the ship. The USS Excelsior NX-2000 spent nearly a full year in Spacedock while engineering specialists struggled to diagnose and repair the various problems. Re-launched early in 2286, the ship met with little more success. Although the fatal flaw of the Transwarp drive was repaired, the system was subject to major problems and over the next year it never completed a successful test, much to the embarrassment of Captain Styles and his crew. Finally Starfleet put the Transwarp project on hold indefinitely while the Federation's scientific and technological advances caught up with the Transwarp theories. For a short time the Excelsior faced decommissioning. Rather than just allow the Excelsior to stand idle in Spacedock while an uninformed team of Admirals decided what to do with the prototype and the embarrassment the Transwarp project. Starfleet Admiral Harry Morrow ordered an evaluation of the prototype, carried out by some of the Federation's finest minds in Starship Engineering. It was discovered that there was nothing wrong with the basic engineering of the space frame, and in all other areas the Excelsior-class was still the most advanced ship in Starfleet, by a considerable margin. In light of this Starfleet rapidly decided to fit the Excelsior- class with a more conventional propulsion system. This process went remarkably smoothly, and by the end of the year the Excelsior was in space again. From here the history of the ship leapt from one extreme to the other; from being a costly and embarrassing failure, the Excelsior rapidly built a reputation for outstanding performance and a solid reliability few other designs have matched. Equipped with nearly triple the amount of science labs and carrying the most advanced package of sensors ever conceived by the Federation, the Excelsior-class is a more than adequate successor to the Constitution-class line as, Starfleet's main platform for space exploration. In addition, her speed and manoeuvrability, coupled with her capabilities make the Excelsior-class more than a match for any class of vessel currently serving the Romulan or Klingon fleets, from the Battlecruisers, to the Bird of Prey classes.